Figure 1. Above the Arctic Circle, the Sun never sets on the longest days of summer and never rises on the shortest days of winter. The number of hours of daylight can affect whether the ground freezes or thaws. Some of the things that cause the ground to freeze, and to stay frozen, are complicated processes that are hidden from sight. Others may be simple, like whether a hillside is covered in trees or snow. Ordinary events like day and night, summer and winter, can also make the difference between whether the ground is seasonally frozen or permanently frozen (permafrost). Although in winter there are fewer hours of daylight for many people around the world, Arctic winter days are even shorter. The Inuit people, who have lived in the Arctic for many thousands of years, talk about Tauvikjuaq, an Inuit word meaning "time of great darkness." Tauvikjuaq occurs in mid-winter, a time when the sun never appears above the horizon. The ground is very cold, and stays frozen. 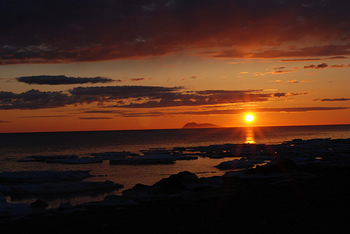 The Inuit celebrate the end of this dark period, calling it the Return of the Sun. In the town of Igloolik, Canada, the people have a big party and build a qaggiq, a massive igloo. The long, Arctic winter nights are only one factor affecting frozen ground. How does night and day affect frozen ground, and what other things affect frozen ground? How do night and day affect frozen ground? As the Earth spins on its axis, the Sun shines on only half of the Earth at a time, creating night and day. In some parts of Earth, temperature swings between night and day can make the ground freeze and thaw. Why do night and day affect frozen ground? At night, the ground stops taking in heat from the Sun. The ground releases heat it stored during the day. In many places on Earth, the temperature difference between daytime and nighttime is large. The ground may freeze overnight and then thaw the next day with the Sun's heat. Day and night temperature swings partly depend on the season. How do the seasons affect frozen ground? Earth's orbit and the tilt of the Earth on its axis create the seasons. As Earth orbits the Sun, it stays tilted in the same direction. 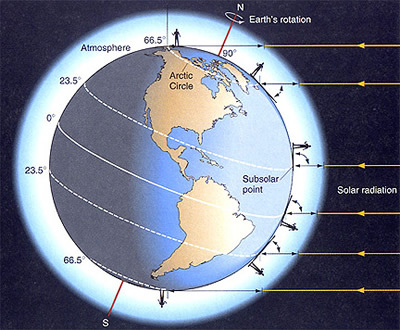 Depending on the point in Earth's orbit, a hemisphere can be tilted towards the Sun, or away from the Sun. The hemisphere that is tilted towards the Sun has summer, and the hemisphere that is tilted away from the Sun has winter.The tilting causes the Sun's rays to hit the Earth at an angle, causing them to spread out over a larger surface, so winter is cooler. In summer, the northern hemisphere is tilted towards the Sun, so solar energy is stronger when it reaches the ground, making summers warmer. The tilting of Earth in its orbit also changes the length of daytime. In the summer, days are longer and nights are shorter. In the winter, days are shorter and nights are longer. So during the summer, the ground has more time to absorb heat and fewer hours to release it. The ground warms. In some places, the top layer of ground, which has been frozen over the winter, thaws. It may refreeze again the next winter. Areas where the ground freezes and thaws with the seasons have seasonally frozen ground. In some places, the ground only absorbs enough heat in the summer to thaw the top layer of the ground. This top layer of ground is called the active layer . The layer underneath stays frozen. Areas where part or all of the ground stays frozen for at least two years in a row have permafrost. These changes in the length of days with the seasons are more extreme near Earth's poles. During the summer, when the Earth's tilt brings the northern or southern hemisphere closer to the sun, days are very long. For example, people living north of the the Arctic Circle see the Sun for twenty-four hours on the longest days of the year. On those days, it is never dark (Figure 1). During the winter, when Earth's tilt causes a hemisphere to be farther away from the Sun, the sun does not rise in the Arctic for two months. In comparison, at the Equator, day and night are each about 12 hours long all year long. Figure 2. The Sun's rays have to travel farther through the atmosphere at higher latitudes. Less heat reaches the ground. This image shows Earth's position during summer in the Northern Hemisphere. The Sun is out of the image, to the right. The yellow lines and arrowheads represent the Sun's rays. How does global location affect frozen ground? Some places on Earth are more or less likely to have frozen ground depending on where they are located. Colder areas near Earth's poles are higher in latitude. They have more frozen ground than places closer to the Equator, which are lower in latitude. Places at higher latitudes are colder because the Sun's rays are weaker there (Figure 2). Nearer to the poles, the Sun's rays have to travel a longer distance through Earth's atmosphere before they reach the ground. The long trip through the atmosphere weakens the solar energy. Less of the Sun's energy reaches the ground at high latitudes. In comparison, the Equator is closest to the Sun throughout the year, and solar energy has to pass through less atmosphere than at higher latitudes. As a result, the Equator receives the most solar energy. So the poles of the Earth are colder than the Equator, and higher latitudes contain more frozen ground. How does the elevation of land affect frozen ground? Places with higher altitudes are colder because Earth's atmosphere is thinner there. Earth's atmosphere is like a blanket. It holds heat near Earth's surface. The atmosphere is thinner at higher altitudes, so it does not trap heat as well. Places that are high can be very cold. For every 100 meters (328 feet) increase in altitude, the air temperature usually drops 0.6° Celsius (1° Fahrenheit). Places that are very high, like the tops of mountains, are colder than the land around them. These high-altitude locations have frozen ground. If this ground stays frozen for at least two years in a row, scientists call it alpine permafrost. Figure 3. Snow acts like a blanket over the ground. 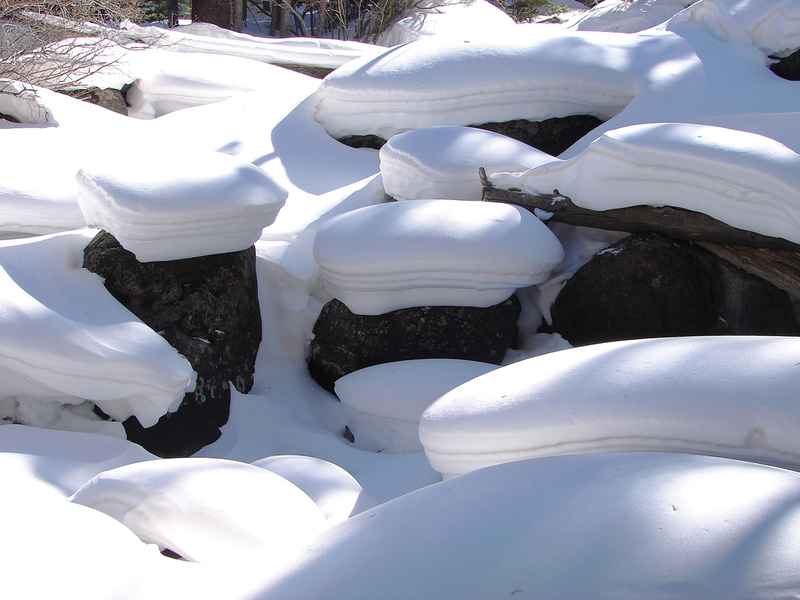 These snow pillows in Colorado keep the ground underneath them warmer. Figure 4. 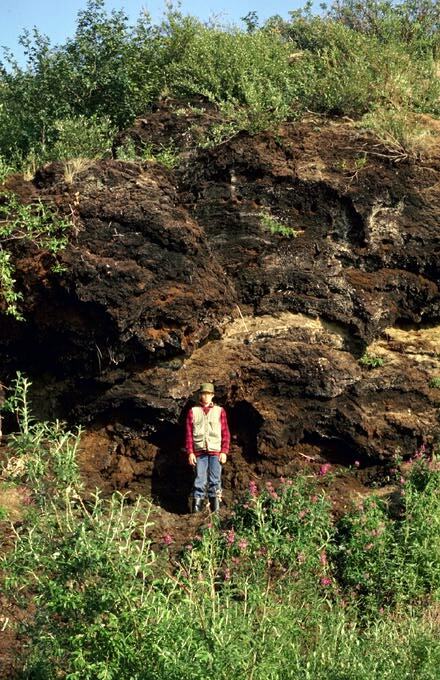 This man is standing in front of a thick layer of peat, which starts near his feet and goes almost to the top of the photograph. Peat helps keep frozen ground cool. Figure 5. 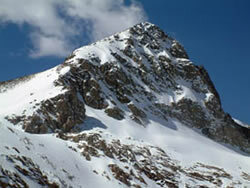 The peak of Mount Toll, in Colorado's Indian Peaks Wilderness, has steep sides. Steep slopes do not hold snow cover very well, and often have frozen ground. A thick layer of snow acts like a blanket so that heat does not leave the ground (Figure 3). Only a thin layer of ground will freeze under a thick layer of snow. 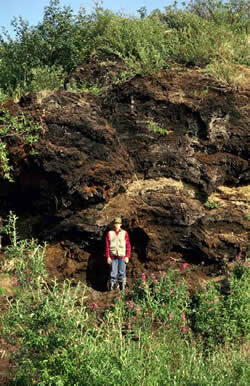 Peat is soil that forms when dead plants do not decompose all the way (Figure 4). Peat is found in marshy areas that form when the active layer thaws. The ground under peat is usually colder than ground not covered by a peat layer. In the winter, peat freezes and allows heat to leave the ground. Because the heat escapes, more frozen ground and permafrost form. In the summer, some areas of peat can dry out. This occurs when the land rises up because of peat plateaus and palsas. Peat plateaus are flat-topped areas of peat; palsas are peat mounds of permafrost. Peat plateaus and palsas both stick up above the surrounding land, exposing the sides and top to the air, so they can dry out. Also, snow usually blows away from the top of peat plateaus and palsas, so they lose their insulating layer of snow. Peat plateaus and palsas do not transfer heat very well from the surface to deeper layers of the ground. So the ground under these dry peat formations stays colder, and is often frozen ground or permafrost. Hillsides and mountain slopes can affect frozen ground and permafrost (Figure 5). If a slope gets more sunlight because of the way it faces, the ground will be warmer and will be less likely to freeze. In the Northern Hemisphere, slopes that face south, towards the Sun, get more sunlight than shady slopes that face north, away from the Sun. The opposite is true in the Southern Hemisphere. Steep slopes are likely to contain frozen ground. The steepness of the slope affects how much sunlight it gets. Steep slopes do not get as much direct sunlight, so they are colder. Steep slopes do not hold snow cover very well, so the bare ground loses more heat. As mentioned above, snow acts as an insulator, trapping the ground's heat. The lack of snow allows a steep slope to lose heat and get colder. Wind direction also affects whether frozen ground forms. If a slope faces into the wind, the ground will lose more heat. Plus, the wind will blow snow away making the ground even colder. 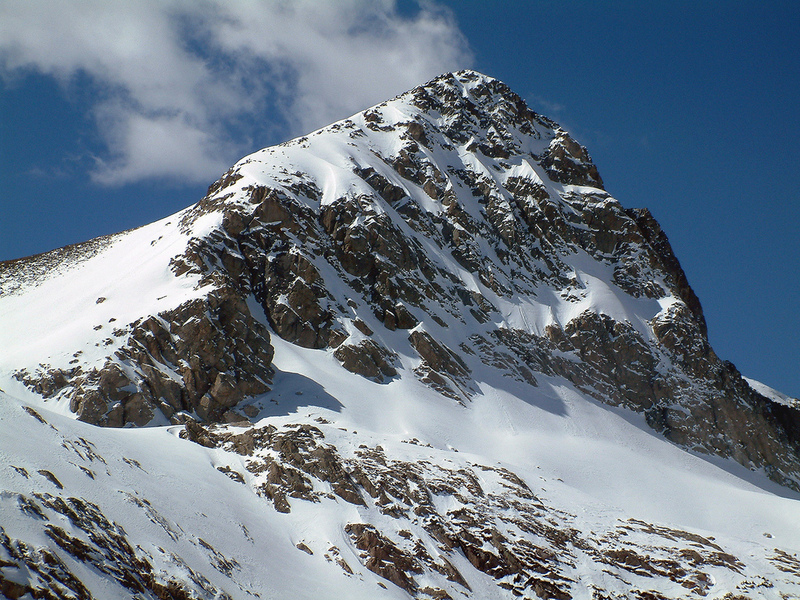 Wind-blown slopes are more likely to have frozen ground. Lakes and rivers are sources of heat in cold places. The water is warmer than the surrounding air and can keep the ground beneath it warmer in the winter. Lakes and rivers might not have frozen ground under them. Or, they might have a thicker active layer compared to nearby land. The unfrozen ground under a river or lake within a permafrost region is an example of a talik. The long-term pattern of weather in a region has a huge affect on frozen ground. To learn more, see Climate and Frozen Ground.